So, it appears that the committee tasked with holding Southwark Council to account agrees with us on a pretty major point. The Southwark Council Oversight and Scrutiny Committee in recent days said that “the most plausible option” for a new leisure centre is the total redevelopment of the Seven Islands site. This is part of the revised recommendations it issued after grilling Councillor Mark Williams, the cabinet member for regeneration and new homes, last month on the council’s deeply controversial plan to cut down dozens of trees and build it on a wildlife area (outlined in red) instead. You can find all the committee’s recommendations here. 3. Frustratingly, Councillor Williams has been allowed to disregard the committee’s previous recommendation that he publicly commit to reviewing the preferred site if there were overwhelming public opposition – this has now been watered down to a feeble request that he merely “listen to the consultation”. There is now going to be a public consultation on the council’s determination to build on the wildlife area. It has all the makings of a rubber-stamping exercise for a decision it has already taken – unless local people make themselves heard. The Canada Water West Residents Action Group will be going door to door during the consultation period to fight this half-baked scheme and we’d be enormously grateful if more people got in touch to offer help. Please email canadawaterwest@gmail.com. In response to a freedom of information act request, Southwark Council has released a document drawn up as recently as November 2013 that examined its options for renewing or replacing the Seven Islands leisure centre. The research, carried out by AFLS+P Architects, looked at three sites for a new leisure centre (see excerpt below). Not one of them was the wildlife area site on the edge of the Surrey Quays shopping centre site that it now wants to chop down. The document revealed that the council had identified three potential sites that could accommodate a new leisure centre at Canada Water. The first was the site of the current Seven Islands leisure centre on Lower Road. The second (site 2 on the picture above) was opposite the Canada Water bus station and library on the shopping centre’s overflow car park. The third was part of Harmsworth Quay. Nowhere in the document did the council or its architect advisers discuss the wildlife area site that has suddenly emerged as the council’s favourite location for a new leisure centre! But just a year and a half after this detailed research was published, the council has decided to ignore the three sites it examined at length and push to locate the leisure centre on this wildlife area instead, which would involve cutting down dozens of trees and damaging an established ecosystem of plants and animals. To us, it appears that this u-turn has clearly come about because Southwark Council now wants to use the Canada Water regeneration as a cash cow – no matter what the impact on the scheme’s neighbours, who face having a huge building erected claustrophically close to their back doors. At a meeting of the Southwark Council oversight and scrutiny committee last week, the Canada Water West Residents Action Group did not receive a satisfactory answer as to why the council was now pursuing this controversial site. Even worse, at the meeting Southwark Council refused to accept a recommendation made by its own oversight and scrutiny committee when it analysed the leisure centre issue last month. The committee had called on Councillor Mark Williams, the cabinet member for regeneration and new homes, to give a public commitment that he would review his preference for the wildlife area site if the controversial plan received overwhelming public opposition in a forthcoming consultation. Yet Cllr Williams insisted that he should not be bound by such an undertaking, claiming that it could disadvantage the council in commercial negotiations with British Land, the developer that is responsible for the lion’s share of the Canada Water regeneration. The Canada Water Residents Action Group will, however, continue to fight this shortsighted plan, believing that the council needs to think less about commercial considerations and more about local residents. After all, the council’s own research has shown that the wildlife area site is not the first choice, second choice or even third choice for a vital new facility for the community. You can read the research that was unearthed by the freedom of information act request here. Southwark News also ran a short piece on the latest oversight and scrutiny committee meeting here. At October’s Overview and Scrutiny Committee meeting, Cllr Mark Williams and his team will again be justifying his decision to build a new leisure centre on top of the Surrey Quays Wildlife Area. He has spent a month reflecting on his decision and doing the work that was missing in his previous report i.e. naming alternative sites and discussing their merits. We have been promised a full presentation tomorrow (20th October) which will include architectural sketches of the new leisure centre and more information on the facilities themselves. Make sure you’re there to hear it first hand. Just go to the reception at the Council’s offices (160 Tooley St) and ask for the Overview and Scrutiny Committee. We still have lots of questions which we hope get answered tomorrow and whatever happens, we will fight on to prevent the destruction of trees and the relocation of the leisure centre. We have received an email from Southwark Council with the good news that it will go back and look again at alternatives to its plan to knock down Seven Islands and construct a replacement leisure centre on the Surrey Quays wildlife area. The email, from Councillor Mark Williams, the Southwark Council cabinet member for regeneration and new homes, came after residents were able to present their case to the council’s Oversight and Scrutiny Committee meeting earlier this month. He said it was clear at the meeting that “members and local residents have concerns about the council’s proposed preferred location of the new leisure centre”. Therefore, given the ongoing public concern I will look again at all of the other sites we considered, look again at the emerging Masterplan of the wider redevelopment with British Land, to make sure that we have properly considered all of the options and are putting forward the best possible option. I will then go back to the Overview and Scrutiny committee later in October and report our findings. We will then undertake public consultation on both the location and the possible design for the new centre wherever that may be, including the best possible measures to mitigate any impact on residents. While I cannot commit to change the council’s preferred site, I hope that the steps I have outlined provides assurance to local residents that we will be as thorough as possible in reaching the best outcome for both yourselves and people from the wider area. We welcome this move and will engage constructively in the hope we can secure a rethink. Councillor Williams’ email followed confirmation on Friday of the resolution passed by the Oversight and Scrutiny Committee, which includes a recommendation that he gives a public commitment to review the council’s preferred site plan if it receives “overwhelming public opposition” in the forthcoming public consultation. 1. The consultation takes place at the same time for all residents in the affected area of the proposed site and those in the wider area. 2. In order to reassure affected residents regarding the consultation on the proposed new site for the Canada Water leisure centre, the cabinet member should give a public commitment to review the council’s decision to have a preferred site should the consultation receive overwhelming public opposition. 3. The consultation be amended to include details of the options that have been considered and rejected, including other sites within the footprint of the land where the council owns the freehold and whether or not the existing Seven Islands can be demolished and rebuilt, in addition to the preferred option of the council. The Canada Water Consultative Forum was set up in 2000 to consider all the major plans and policies relating to the regeneration of the Canada Water area. In our opinion the decision to proceed with expensive consultation on the preferred site for the new Canada Water Leisure Centre is premature and based on a somewhat flawed report and jeopardises further meaningful consultation on the wider master plan. 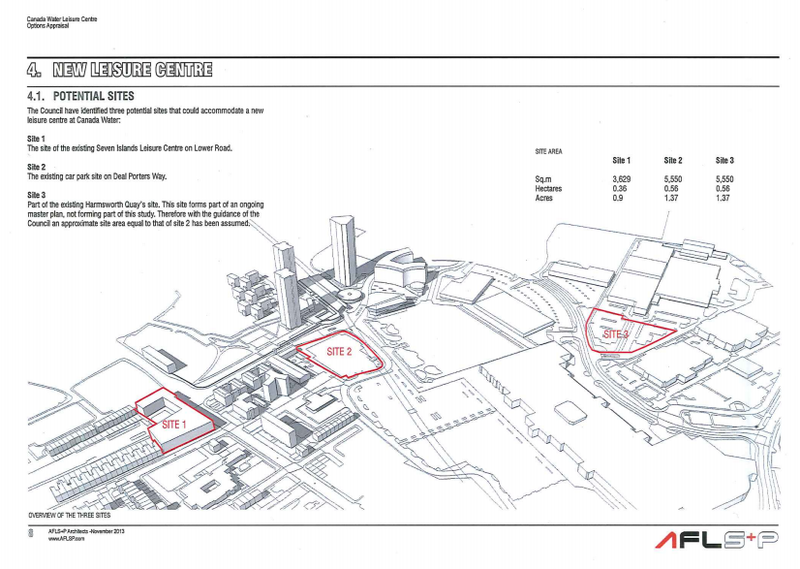 British Land had been promising an Olympic-sized swimming pool when it won the bidding to redevelop the wider Canada Water area over a decade ago, she pointed out – that would have been 50m long rather than the 25m now being planned (which will also be a reduction on the 33m pool we have at Seven Islands currently). A leisure centre in the ‘preferred location’ is likely to be airless and have very little natural light. Quite different to the current 7 Islands which has floor to ceiling windows on both sides and overlooks a garden. She also drew attention to the uncertainty over whether Transport for London would agree to the new leisure centre being erected on the wildlife area, given how close that site is to its Overground track, tunnel and ventilation shaft. 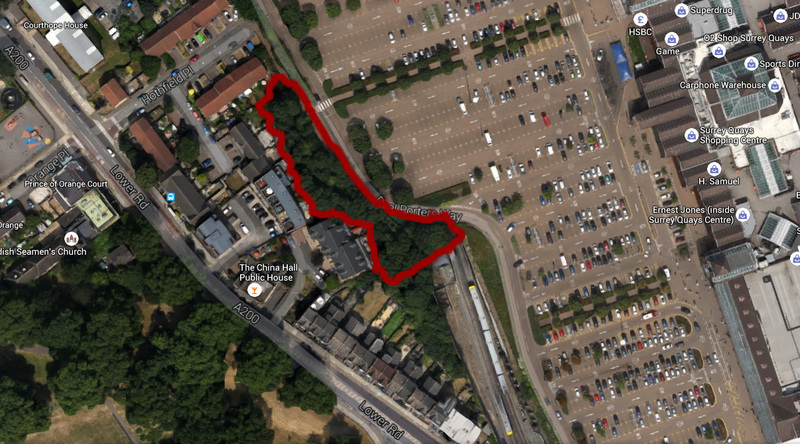 The trees that the council now wants to cut down in the wildlife area were supposed to be preserved as a landscape buffer in the Canada Water Area Action Plan, she added. This area action plan was adopted by Southwark Council. You can read her submission here. Or watch her evidence on video above.